I made this beer on a whim, had the ingredients and a basic porter recipe. I monkeyed around with the ingredients list till I got what I think might be a good or at least interesting beer. 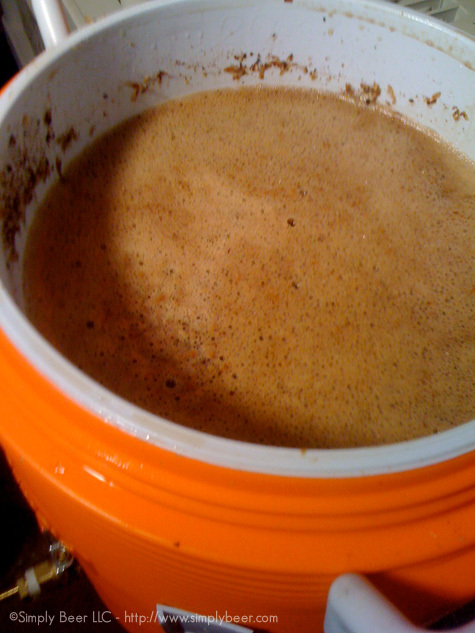 First of, started with a liter yeast starting using dryed Nottingham British Ale yeast. This yeast has a pretty high attenuation, which I though might balance out some of the sweetness from the pumpkin and spices. Mash grains with 1.25 q/lb for 60 min. Then sparge with 170° for 90 minutes. resulting in a total wort collection of 6 gal. 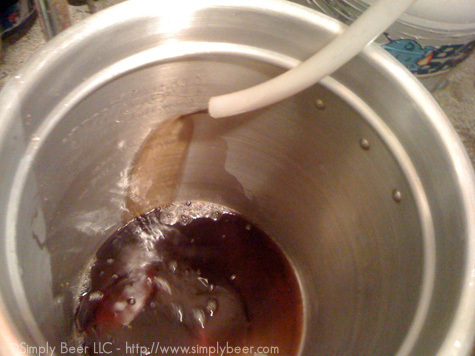 boil the wort for 60 minutes adding the following ingredients at their specified intervals. finally cool to 75° or less, transfer to primary vessel, take hydrometer reading. Original Gravity should be about 1.062-1.068. Pitch starter into fermentation vessel and your on your way. Keg 2 weeks – Drink! That’ s amazing actually. Its like magic, or science. Are you planning on bringing any of this to those homebrew meetups on Tuesdays? 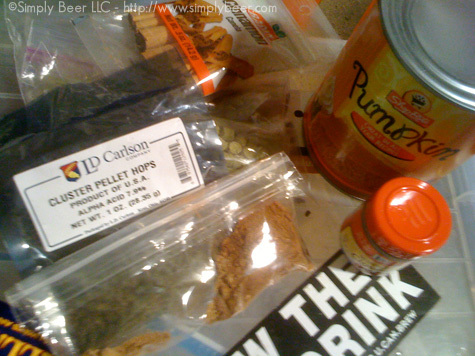 I read up on another blog (can’t remember which one) about a guy trying a pumpkin homebrew. He stated that the pumkin was added during the mash. I thought that was odd. I’ve never brewed a pumpkin, but I had assumed the puree was added in the boil, like yours there. Pumkin porter…sounds interesting. Is your lauter tun there 5 or 10 gallon? I’m trying to upgrade to 10, myself. Actually taking apart my old dishwasher…using the motor to create an internal automatic stirring arm, and the heating element and thermometer to hopefully step mash in the cooler rather than brew pot. it was the Captain’s Chair, that’s what inspired this recipe. I thought the pumpkin in the mash as odd, but if you’re using real pumpkin it may be what is needed. I’m not a huge fan of pumpkin beer, but what the hell ya never know and I don’t recall ever really seeing a commercial pumpkin porter. 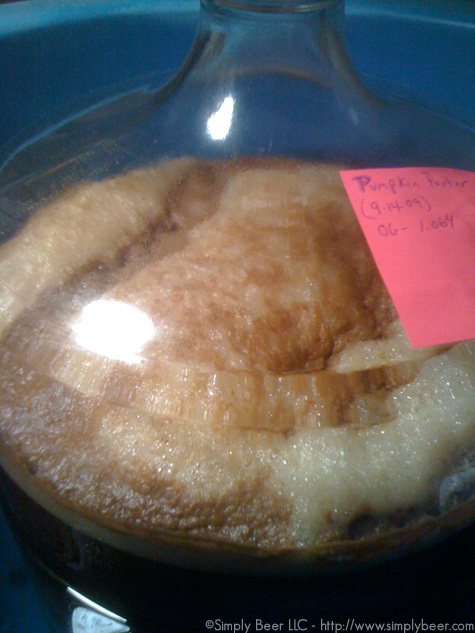 it’s 5 gal :-(… have a max capacity of about 11.5 lbs of grain. I’m looking to upgrade to 10-15 gal to give myself some room. What your doing sounds interesting. I hope you document the building of it on your blog! Mashing is the process of breaking down starch into >>fermentable<< and non-fermentable sugars through temperature controlled steeping in water. 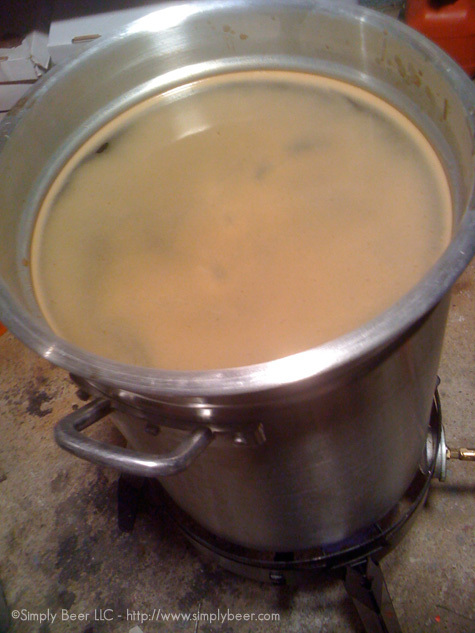 Adding at the first stage allows you to use it like a grain akin to how oatmeal stouts among others are brewed. Then you really have only two ways to impart flavor to a beer you can modify the ingredients so as to subsume the fruit pulp into the body and introduce the basic flavor or you can "salt" it at the end and add the flavor as a separate item. The first way imparts a subtle flavor that will mingle and possible change and the second one will pop and stay true to it's taste; but may come across as forced. Since I didn’t use real roasted pumpkin, I felt the boil was a better spot to add the puree, then the mash. If this turns out palatable, I may try it again next year with real roasted pumpkin in the mash. One pound of canned pumpkin has 15 grams of sugar and only 8 g of starch. There’s just not much in the way of fermentables to be had by mashing the pumpkin. So it seems like when to add it is mostly a consideration of flavor. Another possibility, as is common with other fruits, is to add pumpkin in the secondary to capture delicate flavors that might blow off during the vigorous primary fermentation.